Wondering where to ride your bike on a sunny Sunday ? Let's get together with many cyclists on the 3rd Sunday of every month and ride the Arakawa Cycling Course in Tokyo! The December ride is scheduled to take place on Dec. 17(Sun). The ride is a casual one, so don't worry about being a beginner cyclist. Get to know many fellow cyclists, and get to look at lots of interesting bikes. The ride starts from Ukimafunato Park located in front of the JR Ukimafunato Station (Saitama), and heads downstream along the Arakawa River for approximately 30 km, finishing at Kasai Rinkai Park (Tokyo Bay). You can participate with any kind of bicycle, be it a folder, a recumbent or even a mama-chari ! Take a look at the Arakawa Cycling Page for more information, and drop us a note at cycle_tokyo"at-mark"cycling.jp(replace"at-mark" with @) if you're interested in joining the ride. Cycle Tokyo ! provides detailed cycling information around the Tokyo area, but what about cycling Japan in general ? Japan Cycling Navigator is a good source for information for cycling in Japan. General information can be found about food, the language, public transport, accomodations, and everything else you would expect in Japan. This site and Cycle Tokyo! established a good partnership, acting mutually with each other with Japan Cycle Navigator acting as a general information site, and Cycle Tokyo! providing area information for Tokyo. Don't forget to take a look at this great site, before coming over to cycle in Japan ! 2006 was special for the Cycle Tokyo Project being it's startup year, with the website going online in July. We've continued to grow the site with more information since the start. We currently have a list of ride course recommendations, 3 of them with detailed explanations and route maps. We plan to expand on that. We have a good list of bike shops around Tokyo, some riding tips, and a list of good references. Feedback is welcome, please tell us what kind of information you need in your bike life in Tokyo.Your advice helps to make a good useful site and source of information. 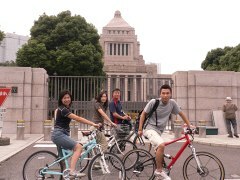 Inquiries range from rental bike information to from people overseas planning a visit, as well as resident cyclists of Tokyo. Of course, we get requests for guided rides, which is mentioned below. We offer volunteer bike rides as part of our activity. Though we honestly didn't expect much of this to happen in '2006, we were again surprized to recieve multiple requests right from the beginning. Since we all have daytime jobs, it was sad that we had to decline some of them with regret. We hope they had a good time riding in Tokyo anyway. In July (yes, right after our website opening ! ), we had our first guided tour. The Bike Friday Hokkaido Tour group, had requested for a guided tour of Tokyo on their bikes, on their stop-by in Tokyo. We took the group of 11 around lower (traditional) Tokyo covering the old and new of Tokyo, stopping by places such as Tsukishima, Tokyo Tower, Zoujouji, and Ginza. 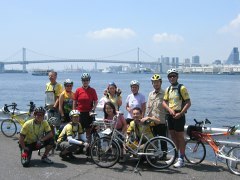 The guide tour ended near the imperial palace where we set up a Bike Friday gathering with local enthusiasts. In the end of September, we had a chance to meet 2 couples from Hong Kong visiting Tokyo. We planned a short ride based on the "Japanese fast-food" bike tour, which they requested. Cycling around Tokyo must have been a very interesting experience, as we learned cycling around town in Hong Kong was not a typical thing to do. During the ride, we challenged their appetite and curiosity with traditional fast food such as Taiyaki, Nikuman, and Takoyaki. Thanks Angel and the gang ! Considering it was our first 6 months, we had alot of activity going on, much more than we expected. We had thought that the momentum build up after the website opening would be much slower, so this was a happy surprise for us. For 2007, we plan to continue the effort (and fun !) we put in this year, continue providing interesting information both online and offline. and keep building our status as the one-stop reference for Tokyo cycling ! Again, feedback and comments are welcome, as they will help to make the website and our service better. This page contains all entries posted to Cycle Tokyo ! Weblog in December 2006. They are listed from oldest to newest.